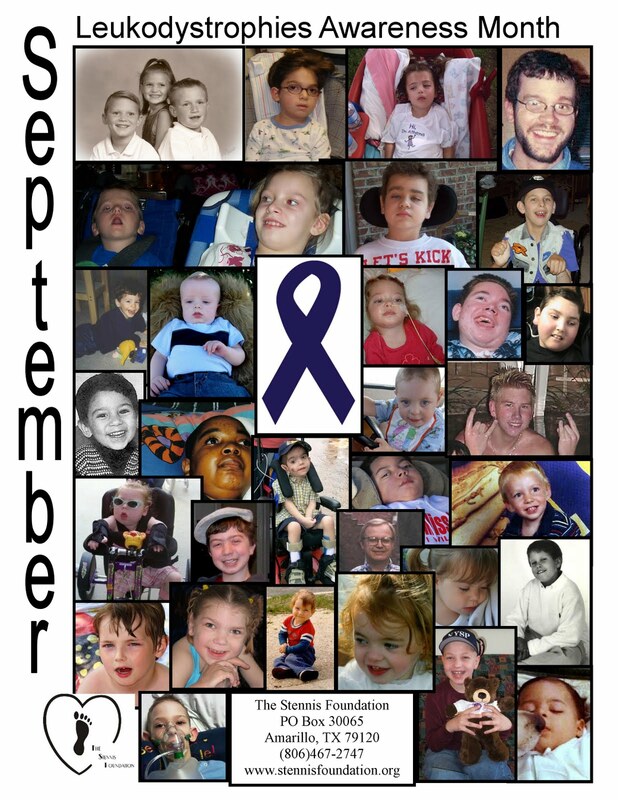 Our mission remains the same: Raising awareness of Leukodystrophies and funds for research. Your generous support, especially at this time of year, is greatly appreciated. 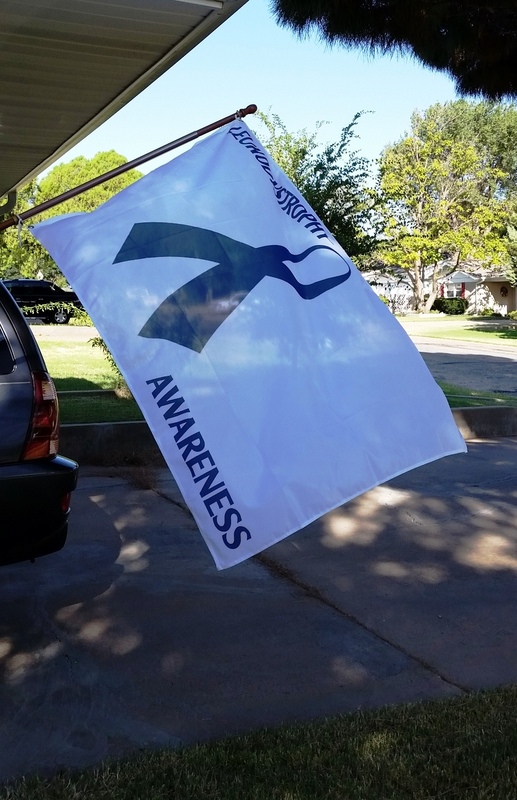 *please note: The flags were only available during our Awareness campaign in September. 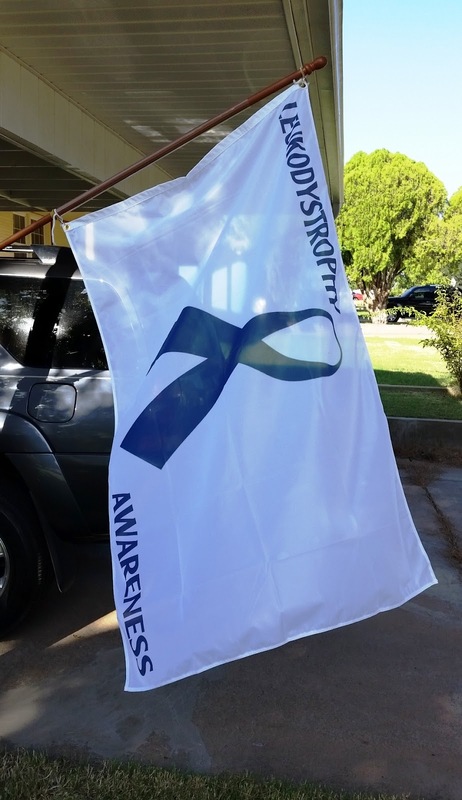 Order your fabulous Leukodystrophy Awareness flag with a gift of $100 or more to The Stennis Foundation! The flags are huge (standard flag size of 3'x 5')! They are white, with the Navy Blue Awareness Ribbon, and the words "LEUKODYSTROPHY AWARENESS." The flags have two grommets on the edge to attach to your flagpole. 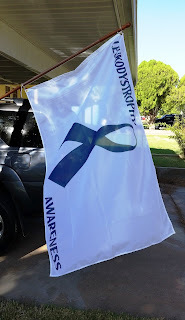 Click the button to donate, and order your flags! You can donate to Stennis Foundation every time you make a purchase on Amazon. It's true! Just click this link, and you will be registered to support Stennis Foundation with your purchases. It's that easy! Click on the picture, and you will be taken to the site. 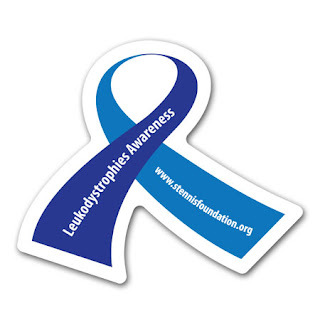 These fabulous magnets for Leukodystrophies Awareness are on their way! We should have them in within 2 weeks! You can get them for $1.25 each, plus postage. Please let us know how many you would like. When they arrive, we will figure postage and let you know. Thanks for your support! Because of your generosity, we are "One Step Closer to a Cure!" September is Leukodystrophies Awareness Month. Wear navy blue all month long. Tie navy blue ribbons on your car antennas; tie them on your trees. Encourage all your friends and family members to do the same! People will notice, and when they ask about it, we can tell them all about Leukodystrophies! Saturday, September 25, 2010 -- the last Saturday in September -- is World Leukodystrophies Day. 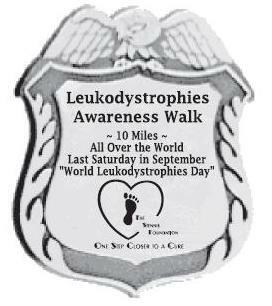 The Stennis Foundation is sponsoring the "It's the L.A.W.™" Campaign -- the Leukodystrophies Awareness Walk. The L.A.W. is 10 miles in length, and it's wherever you are. Map your course, and take off walking. Pledge sheets are available for download here. Even if you do not walk that day, please consider obtaining sponsors for this event! We also have these pin-on badges for only $2 each (includes shipping in the US. Outside the US, please contact us for shipping information). You can download an order form here and send in with a check, or you can use the "Donate" link, and include your information in the space provided. Think of all the awareness we will raise! We have shirts from our Walks! Shirts are $12 each, and includes shipping. US only. We do not have any 2X left. We have S, M, L, XL in adults, and S, M, L in childrens. To get shirts, just use the Donate link at http://www.stennisfoundation.org/web, and when you get to the PayPal page, you can enter any instructions. You can also order by sending a check to The Stennis Foundation, PO Box 30065, Amarillo, TX 79120. Also, the Southfork Hotel is our hotel sponsor for the Walk! If you are coming from out of town, please do not reserve your room online, but call the Southfork Hotel directly, 866-665-2680 or 972-578-8555, and tell them you will be there for the Walk. Please pass this information along to everyone you know! The success of the Walk depends on everyone working together!! Our Beautiful New Cookbook is here!